2012 was a busy year for The Sims 3. 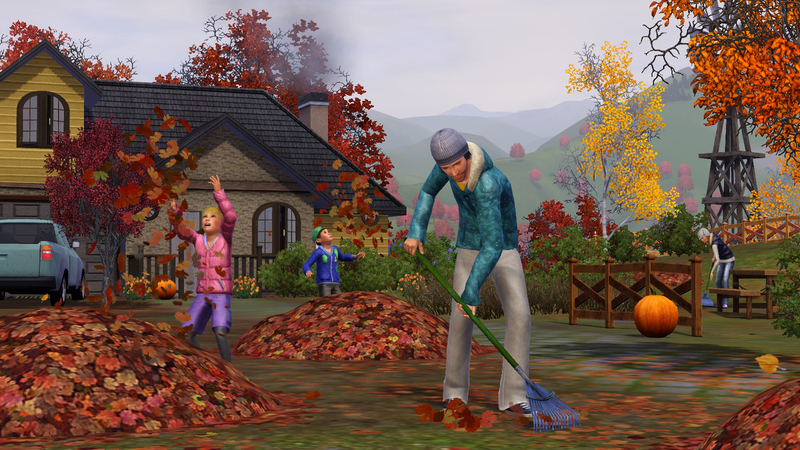 Seasons is the third, and last expansion pack released last year and it adds some features that Sims fans have been yearning for since the base game came out in 2009: weather and…aliens. 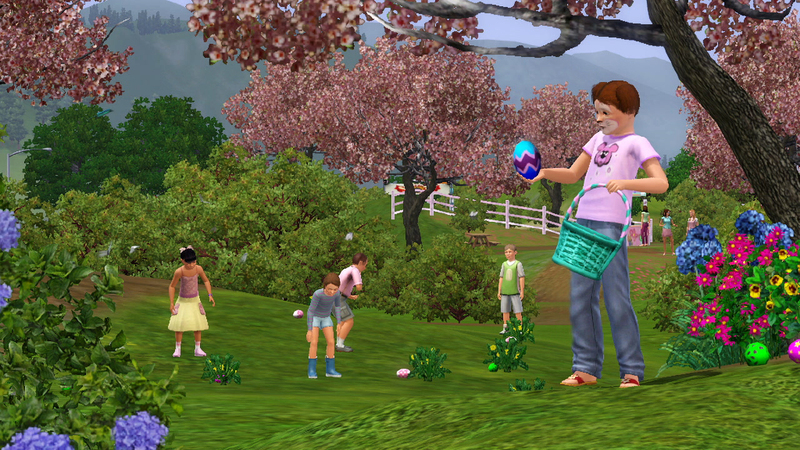 The Sims 3 Seasons includes many of the features that were in The Sims 2 Seasons expansion pack: changing seasons and various weather types and activities associated with them. This time around, each season has its own festival and a special day associated with it. Your Sims will be able to stay home from school or work on this particular day and take part in the festivities (or just do nothing). Summer is a warm season, where Sims can enjoy sunny days (just beware of burning!) and the occasional shower or thunderstorm. Sims can also now swim in the sea, and the new lounger item lets your Sim be in the pool without actually swimming. The festival includes a roller skating rink, soccer goals, a spray tan booth and a hot dog eating contest. There is also Leisure Day, when Sims get the chance to kick back, relax, enjoy the lovely weather, or perhaps throw a pool party. Fall (autumn) is when things start to get a bit cooler, and leaves will begin dropping from the trees. As the temperature drops, most of your plants (if you’re a gardener) will go dormant, meaning they won’t grow until it gets warmer again. On the positive side, they are not damaged by the weather in any way, but it does mean a long wait before you can collect your fresh produce again. You are able to plant inside using planter pots to get around this, thought trees don’t fit in these pots. Ponds in the neighbourhood will also start freezing over, although the sea doesn’t freeze, so you could still fish there if you needed to. The autumn festival includes a haunted house, bobbing for apples and a pie eating competition. Trick or treating and costume parties also become an option until Spooky Day, the holiday for the Fall season. Winter in The Sims 3 Seasons means snow. Your Sims will dress up warm to head outside (just make sure they don’t stay out in the cold too long!) and build snowmen and igloos. The festival also offers new activities: snowboarding and ice skating. If your Sim keeps practicing these, they will slowly improve their skills and become more proficient, though it doesn’t show as a skill in their skills tab. Snowflake day offers your Sims the chance to throw Gift or Feast parties, or just enjoy the snowy weather. Spring is when the snow starts to melt and things start to warm up again. The festival includes a kissing booth, a love tester machine, a dance floor and an egg hunt. Love Day is the perfect time for a romantic date with that someone special. All the festivals include a face painting stand, a greeting card booth and a concessions stand, where Sims can buy yummy treats or redeem the festival tickets they have earned for seasonal items for their home. The seasons and weather types can be adjusted through the settings, allowing you to get rid of the things you may not like and maybe increase the length of your summer. The expansion pack also includes numerous clothing items, specifically the new outerwear clothing category, so that your Sims don’t freeze when they go outside on cooler days. Quite a few items of clothing have been added for this category and some of the appropriate clothing from previous expansions and stuff packs has been included as well. Other than that, there are some Hallowe’en costumes for your Sims to don during the autumn holiday. Sadly, there is very little in the way of hairstyles included here, aside from the few that go with the costumes and some warm hats. Seasons also has its fair share of furniture available, lots of it with a seaside holiday theme. The other items are specifically for the seasonal festivals, so things like ice rinks and snowboarding ramps are included as well. There is no new neighbourhood included with Seasons, but you will be able to add festival lots to any of your existing towns. Aliens make a comeback in Seasons and will occasionally abduct unsuspecting Sims who spend too much time stargazing or collecting space rocks. Male Sims once again have a chance of having an alien baby. Aliens may also just visit your Sims, meaning you can become friends with them and eventually ask them to join your family. Seasons has some interaction with the Supernatural expansion through the Weather stone, which each type of Supernatural Sim can use to call forth a certain kind of weather. Pets seem to be oddly impervious to heat or cold. While the new weather offers a variety of activities for your Sims to take part in and it’s great to have aliens back, I still have to wonder why none of this content has been included before now. Or for that matter, why it wasn’t simply included in the base game. Still, it’s a solid expansion pack, especially if you enjoyed The Sims 2 expansion of the same name. Next article Is Valve’s Steam Box a giant mistake?